Top row goes to vibrato channel, bottom row goes to normal channel of my Deluxe Reverb. Pedal on lower right switches between channels. So curious man, the phaser into the compressor? Was that a arrived at config? So that is the chain order you run? 3 to 7 are exact reverse of what I have always done, that's why I love these pedal board threads nice to see what others are doing. Yeah that was killing me, the Eventide at the end, I was having a WTF moment. Most of the time when I try something weird, that is pretty much the result. I suppose creating unique strange tones is what it is but I find I need my rig designed to be the most diverse and musically workable. Some run dirt into octave/harmonizer pedals but it just seems the science at hand indicates a cleaner signal is more suitable for the processor to work with, rather than one all fuzzy. Might create a tone, as really anything will basically work and do something, but the tracking and overall articulation is crappola. Does your higher gain do well in front of the Eventide? I can never get that to sound right. I use my Whammy V more upfront for tracking and makes the gain really massive. I tend to view the issue as some thing hitting the amp front end, not everything sounds right in the loop which is after the preamp gains stages. A harmonizer in the loop would probably have the worse tracking glitch burble possible. Some I am sure some ponder that is part of the tone. I know I have seen that done on the older Whammy pedals, they do not track chords. Saw a few "demos" where some thought that glitch burble tracking error was just part of the "charm" of the unit. Really?? A monophonic pedal does not track polyphonic signal, and one could consider a distorted signal as more complex and polyphonic in harmonics. That being said the new Whammy's are more polyphonic and can handle it better but as I stated below seems like you want your gain structure to be more dominant than the octave tones. I came to this basic axiom of pedal order some time back and I think one will find it holds pretty true across the spectrum. That which goes after something will be the more dominant effect. I call it the rule of dominance. Some things have workable options but I find them to primarily be Vibe or Phasers. Gain after makes for a more massive gain tone, effect after is magnifying the effect more. Plus on a harmonizer unit the tracking seems to just glitch out like crazy trying to lock onto the signal to multiply and divide it. I also marvel at downstage compressors, seems like the way they magnify low level signals and limit peak ones ones way down noise floor hiss is going to increase dramatically. I get the use of studio limiting and track compression but that is not the same as ones initial creation chain. But whatever rings the cow bell. Pedals tend to work no matter what one does to them, whether or not it is a pleasing tone is objective I guess. I find myself needing a switcher pedal unit to be able to move things around like my Vibe or phaser as I like different pre-post gains on them. Maybe a Pedal Palette would do the trick without being over the top expensive. I guess the "proper" place for a phaser is after your distortion and such, but I find it too overbearing in that position. I kind of view it like a wah pedal, coming first in the chain. It is much more subtle that way. One thing though, the Retro-Sonic is the only phaser I have found that is quiet enough to put before compression/distortion. It is dead silent. I had been using it in that position, and bought a few others since to try: the MXR '74 Phase90, the Whirlwind Orange Box and an HBE Psilocybe, and all had too much hiss when used first in the chain. I cannot put anything in front of the compressor although I get the limiting level thing by doing so. I actually have my phaser setup to be after pedal high gain but also before any uber amp/preamp gain so the best of both options. Any effect coming after will be the more dominant one. Wah always in front for me as filers should be before dirt just the way they function as well as octave type pedals which track horribly after and too much of the pedal in the blend after not as organic sounding. I cannot get decent note articulation with a phaser in front, I seldom if ever go for an EVH tone with the front phaser sweep. I find if I am trying to get a more Pagey tone it needs to be after to hear the notes in the chords or a better sweep range. Vibe pedals are a bit of an issue as well, I like both before and after positions in the chain so I try to get either in my chain. Added Analogman Comprossor w attack knob and Fulltone Octafuzz. Also replaced my vintage phasetone with MXR custom script phase90. Much better headroom and bypass. Just wondering why more are not hip to the modern version of the Phase90 in the EVH model which contains both the Block and Script versions of the pedal on a toggle select, also true bypass. Great pedal, you get both versions of the classic Phase90 which is rather cool for slightly few more bucks. Always loved a good phaser and for the money it is hard to beat the good old Phase90 circuit as the bench mark 4 stage cool sounding phaser. This one actually is the exact same circuit as the EVH. I even think you can switch it to block with an internal dip switch. But honestly, I just think the box needs to be orange. As long as it is not pink I am fine. Really hate that color on a pedal, seriously?? Everyone knows gold sounds the best. The EVH is quite nice with the on top toggle for either mode, always was my fav phaser and no tweaking, what a jewel. This is my pedal board I just completed building. 4 of the pedals I built myself. Yeah I think it has an internal but what a inconvenience to pull it off the board and open it up. So nice to be able to just press the switch and get the Script mode. I only got it because it was a nice modern update not because of EVH's paint stripes. Personally, I get sick of all the rainbow colored pedals myself, I would like mine to be all black or gold, anything but pink, what a terrible color for a pedal, at least for me. Must be nice to put them all in a drawer and not see the collage of colors. Empty space will be replaced by a Timmy soon Can't wait! Anyways here, is my modest pedalboard. If you have any questions let me know! I'm pretty proud of this setup and the board I put together. It is a total paradigm shift for me as I've always just used a single multi FX unit of one form or another. I can't say there is any pedal I don't really like but if I lost the Metal Muff I'd probably try something different. In the rehearsal studio I use a 68 fender split with a swr bass amp with just a few lose common pedals. On the road I'm running Ableton/guitar rig with all KMI gear. Using a computer sure makes gain staging and doing everything under the sun easier. Not always a fan of the tone but for live, sacrifices have to be made at the moment. My 2014 board and rackmount guitar rig. PSA 1.1 core preamp. 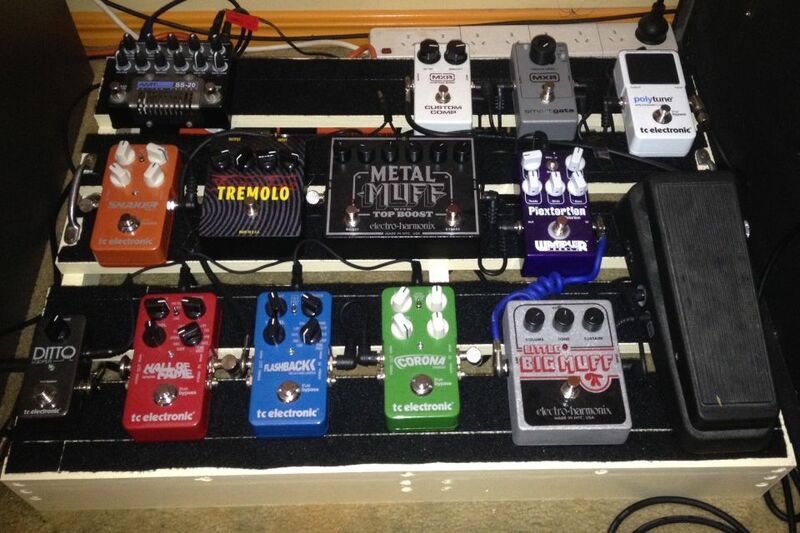 Board has basically two different pedal chain lines combined, old school Trower Vibe and modern heavy fusion. Board goes into PSA then into Presonus using real tubes and converts rack signal to XLR line level. Loving this rig. My half stack blew up on me so I began this experimental rig. Full stereo 100 watt per channel twin 12 cabs Eminence Man O War speakers. I'm not seeing a pic. I dont see it either. Beats me guys, as soon as I pull up the page the pics all come up. The pics are loaded and coming right from the GS site CP album. Have no idea why they are not showing. I am seeing everyone's pics right when the page comes up. Can you see my photo album pics? I have it set to "everyone". darkhorse, the pics weren't showing up initially on my page when others mentioned it either, but now they are. Might have been a glitch in the Matrix!?!?!?! I see you've upgraded to the mini deja vibe 3. Is there any sonic improvement over MDV2, or is it just a new expression chassis? Dude, you should be on Fuller's payroll. I'm going out to get one tomorrow. Dude, reduce size to document on your photo editor before upload would be too cool. Once the windows on these boards load a large pic you have to scroll across to read stuff from then on. By the way, super choice of pedals!! !